Stephen DeBoer and his wife, Lauren, had a baby girl, Lindsay Grason, on April 3 in Attleboro, Mass. She joins big sister Caitlin Elizabeth. 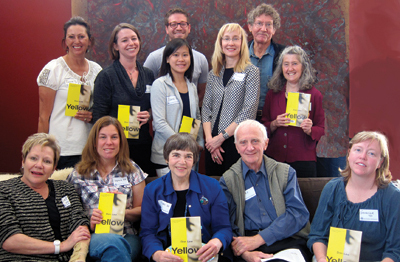 Alumni gathered at a Denver Faculty in the Field event to discuss “Yellow,” Don Lee’s acclaimed collection of short fiction, with Michaele Whelan, vice provost for academic affairs and senior lecturer in English. From left, front row: Betty Wytias ’79, Stephanie Freeman ’89, Frani Rudolph Bickart ’66, Ted Bickart and Genevieve Hale ’94. Middle row: Suzanne Schneller Welles ’76, Alumni Club of Denver president Nicole Hoffman Myers ’96, Joanne Liu ’03, Michaele and Paula Singer ’81. Back row: Brian Botnick ’09 and Martin Pato.